(Charlottetown, P.E.I.) – Confederation Centre of the Arts is pleased to host the Czech Republic’s Ambassador to Canada, Pavel Hrnčíř (pronounced Paul Hern-cheesh), on May 29 in The Confederation Chamber at 4:00 p.m. Ambassador Hrnčíř is coming to the Centre to show his support of our new travel program, “Imperial Cities,” developed in partnership with CAA Member Choice Vacations. This new travel program takes members on an 11-day cultural experience of Prague, Vienna, and Budapest. The program also serves as a fundraiser for the Centre with a percentage of each booking being donated back to support arts education. As Prague is the Ambassador’s homeland, he wanted to stop by the Centre during his visit to Charlottetown to meet the travellers and show his support for the work of the Centre in educating communities on the role of the arts in creating cross-cultural understanding. 4:00 p.m. to 4:35 p.m. If you’re interested in the Imperial Cities travel pack, trip details can be found at by visiting the Charlottetown CAA office. 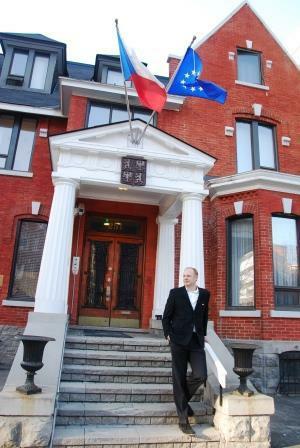 Photo cutline: Confederation Centre of the Arts is pleased to host Czech Ambassador to Canada, Pavel Hrnčíř (pronounced Paul Hern-cheesh) on May 29 in The Chamber at 4:00 p.m.